Blackberry Township assumed the responsibility for the Blackberry Township Cemetery on July 1, 2007. The Cemetery is located on the North East corner of Illinois Rt. 47 and Keslinger Road. The Cemetery was originally called Union Cemetery and was later known as Blackberry Cemetery. The Cemetery was organized as a result of the initiative of the Odd Fellow Lodge #222 in Elburn. A committee was appointed to approach the local Blackberry Lodge Ancient Free and Accepted Masons Under Dispensation, on January 25, 1860, requesting their support in the joint effort to organize a public Cemetery in Blackberry, eventually known as Elburn. Within weeks, a consensus was achieved and a constitution and bylaws drawn and The Union Cemetery became the first public Cemetery in Blackberry "Elburn". A complete set of original notes from these proceedings is available for viewing at the Township Cemetery Office. For the previous century, prior to July 1, 2007, the Cemetery was operated by The Cemetery Association, a non for profit group that Dean Capes, acted as the Association representative. At the Blackberry Township Annual meeting in April 2007 a motion was passed asking the Blackberry Township Board of Trustees to finalize negotiations and to transfer responsibility for operation of the Cemetery to Blackberry Township. Final papers, from the State of Illinois, reflecting the official transfer of responsibility, are dated January 30, 2008. Blackberry Township Cemetery holds a wealth of historical information. The earliest �Born Date� noted on a grave stone is in the 1700�s and the earliest noted "Died Date," the early 1800�s. The Cemetery has veterans interred that served in War of 1812 and many from the Civil War and of course the two World Wars. We encourage you to visit the Cemetery to find these and many other historical bits of information and to view some of the unique family monuments. Blackberry Township Cemetery offers a Cremation Garden. Internment in the Cremation Garden costs $450.00 for Township residence and $500.00 for non residence. This price includes the opening and closing and an engraved brick. We recently opened a new area of the Cemetery in the Northeast corner of the Cemetery for sale of grave sites. Purchase of any standard grave site for Township residents is $800.00 and non residents $1000.00. An additional charge is necessary for an oversized grave space. A standard grave opening and closing during regular business hours is $850.00. Infant and cremation urn O/C fees are $350.00. Additional charges apply for late p.m., Saturday, Sunday, official holidays or for double deep graves. 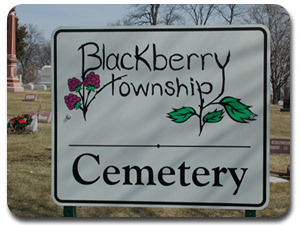 The Blackberry Township Board of Trustees approved on August 14, 2007, Rules and Regulations to govern the Cemetery as well as a fee structure for services. These R & R in their revised form are available for review at any time at the Cemetery Office at the Blackberry Township Building located at 43W390 Main St. Rd., Elburn, IL. The Cemetery telephone number is (630) 365-9109 and the fax number (630) 365-6568. All monuments must be preapproved by the Superintendent. A temporary marker may be erected with preapproval of the superintendent. The Cemetery encourages the erection of grass monuments to facilitate maintenance. Currently the monument permit fee for a flat ground, grass marker, is $25.00 and for an above ground monument the permit fee is $50.00. Fees for monuments must be paid at the time the application is completed at the place of business preparing and installing the monument. The cost of operating the Cemetery is not part of the Blackberry Township tax levy. No tax dollars are used by the Township to support the Cemetery. Operational funds are secured from fees for lots or services as well as from interest on our investments. We welcome your input regarding how Blackberry Township Cemetery can meet your needs and continue to be a pride of our community. If you have someone currently interred at Blackberry Township Cemetery and/or if you own a grave site(s), we would appreciate the opportunity to communicate with you to assure the information we are recording in our data base is accurate. If you desire a Certificate of Ownership issued from Blackberry Township Cemetery, please bring in any evidence of ownership of a grave site or lot and we will work with you to update and validate your records. We welcome genealogical inquires. No fee is associated with these services. Our Rules and Regulations state that all persons entering the Cemetery do so at their own risk. All persons entering the Cemetery are subject to the Cemetery Rules and Regulations. The Cemetery is generally open from dawn to dusk daily. Spring clean up from the winter challenges generally begin on March 1 as weather permits. The Cemetery Office is in the Blackberry Township Building located at 43W390 Main St. Rd., Elburn, IL. 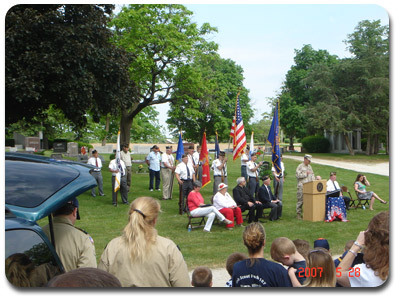 The Cemetery office telephone number is (630) 365-9109 and the fax number (630) 365-6568. If you wish to send and email to the Superintendent of the Cemetery, you may send it to: cemetery@blackberrytwp.com. The address of the Blackberry Township Cemetery, to facilitate visiting loved ones, is located at the north east corner of the intersection of Il. Rt. 47 and Keslinger Rd. The official postal address is 1N 175 Illinois Rt. 47, Elburn, Illinois, 60119. We need you to help keep our Cemetery beautiful and a source of community pride.